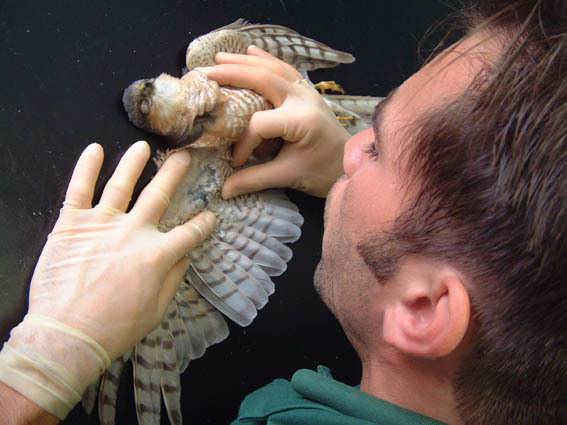 Keywords: avian wildlife casualty; assessment; triage; wound first aid; veterinary wound care. Wound assessment is a very important and often overlooked part of the assessment and examination process of the avian wildlife casualty. Clinical examination should involve a systematic head to toe approach. Only those birds who will make a rapid recovery should be treated. Euthanasia should be considered for birds with complex wounds, such as those with significant infection or where the wound is likely to result in a significant loss of function. Avian casualties can present with a wide range of injuries. Careful assessment of each case is necessary in order to identify those birds requiring urgent euthanasia on humane grounds and those who would benefit from care and rehabilitation. 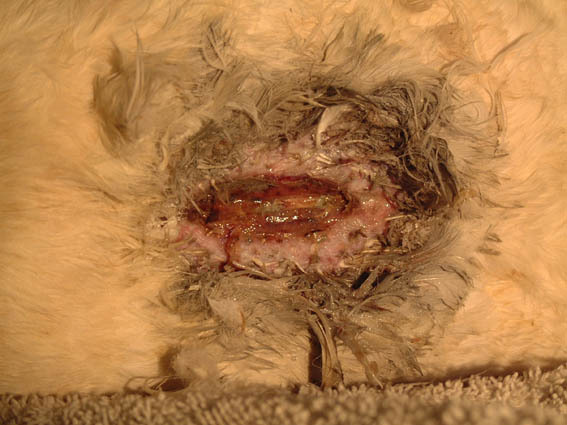 This two-part article will discuss the assessment of wounds in the avian wildlife casualty, patient triage and first aid; appropriate wound management plans for specific wounds will be discussed in part 2. Wound assessment is only one small part of the overall assessment of the avian casualty. It is, however, a very important and often overlooked part of the assessment and examination process. The purpose of any initial assessment and examination is to identify those injuries requiring immediate attention. The key elements of this process are twofold: a history should be taken and an examination performed . The reason given for admission is often misleading as it is can be based on opinions and suspicions rather than real observations. It is therefore essential that as much factual information as possible is recorded. It is important to obtain the name and contact details of the finder should more precise information be required at a later date. It is not unusual for a third party to transport the bird to the hospital and they may not pass on accurate details necessitating a follow-up call. Many birds are territorial and will need to be returned to their own territories when ready for release. Reference to an Ordnance Survey map will identify the exact location of where the bird was found. This can then be tied in with other information such as the proximity of roads, power lines and train lines. Useful clues may be found within the history that will help structure the examination so that important wounds and other injuries are not missed. Caught-by-cat (CBC) birds are, for example, likely to have small, hard-to-find, puncture wounds. They may also have other injuries or problems that have caused them to be caught in the first place. Similarly, swans (Cygnus) that have flown into power lines may have burn injuries, which may not be immediately obvious. The initial examination should be brief but thorough and aim to identify any injuries requiring immediate first aid, veterinary attention or euthanasia. Fluid therapy should be administered to all avian casualties at the time of this examination and the bird then rested. A more detailed examination can be performed an hour or so later. A full clinical examination should be performed once the bird's condition has stabilised. A systematic head to toe approach should be followed. The majority of wounds will be well hidden by the bird's feathering. In the plumage covered regions of most birds, the contour feathers are confined to discrete tracts or pterylae, separated by featherless tracts or apteria . Use can be made of these apteria to help visualise the skin. Puncture wounds can be particularly hard to find. In such cases careful palpation will help to identify blood deposits on the deeper feathering, which may be the only sign of an underlying wound. Examine the beak, oral cavity, eyes, ears and head. Bruising of the oral or ocular mucous membranes may be the only evidence of a head trauma. 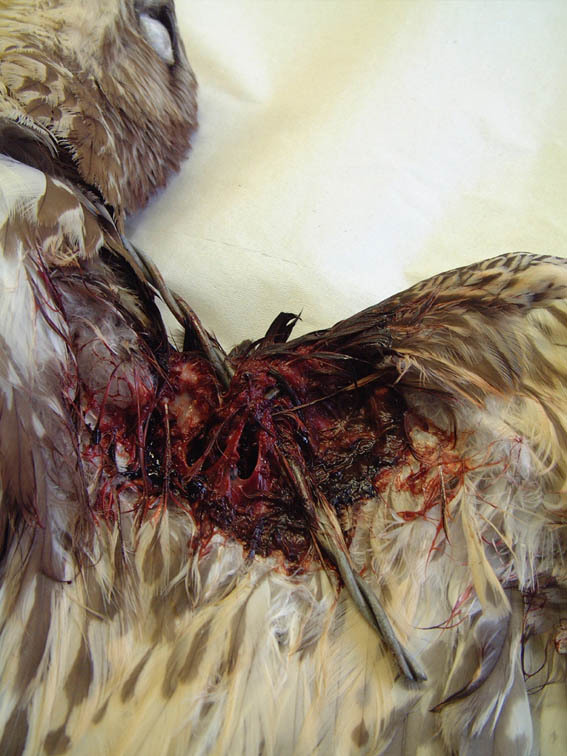 Lacerations to the scalp are common in Eurasian buzzards (Buteo buteo) (Figure 1) but these may be hidden beneath the feathers. Such injuries probably arise as the result of territorial disputes  and are discussed further in part 2, under wound management. 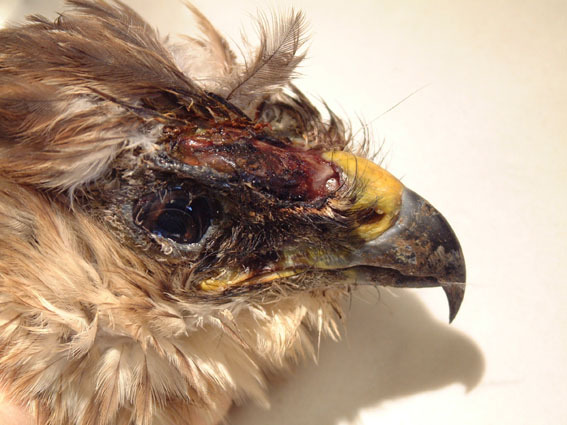 Figure 1 - Figure 1: European buzzard (Buteo buteo) with a severe scalping injury. Note the extensive skin deficit and the associated dessication and necrosis of the exposed tissues. Palpate the neck for neck injuries, oesophageal and crop fistulae. Staining or a break in the feathers may be the only evidence of a neck wound. Swans are liable to have neck injuries following collision with cables or other obstacles. Fishing tackle related problems are common in swans and other waterfowl (Anatidae), as well as seabirds (Figure 2). Crop tears are common in pigeons (Columbidae) following attacks by predators such as the sparrowhawk (Accipiter nisus). In such cases food contamination of the feathers may be evident. 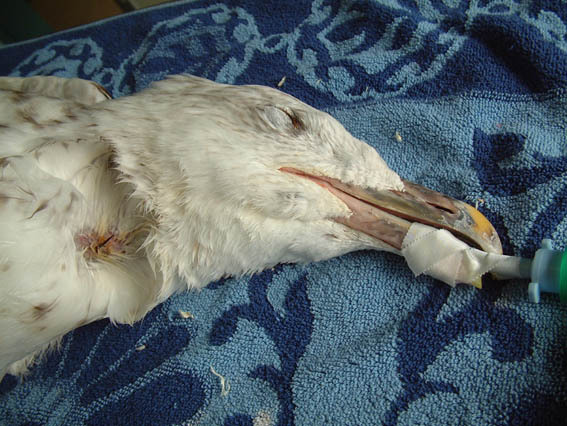 Figure 2 - Figure 2: Anaesthetised great black backed gull (Larus marinus) with barbed fishing hook lodged in the cervical oesophagus and penetrating through to the outside. The hook was well hidden by the bird's dense feathering and only detected following palpation of the neck. Wings are easily traumatised. Collisions appear to be a hazard of life for fast moving predators such as the sparrowhawk. At best such accidents will result in bruising, but further damage to the soft tissues and bones may be present. A systematic palpation of the wing from wing tip to shoulder is necessary and the opportunity should be taken to compare one wing with the other. Feathers should be blown apart to examine the underlying tissues (Figure 3). The use of alcohol will also facilitate the examination of underlying tissues, but results in evaporative heat loss if used too extensively. Figure 3 - Figure 3: Blowing feathers apart over the wing of a sparrowhawk (Accipiter nisus) involved in a road traffic accident - note the severe bruising over the forearm. The tawny owl (Strix aluco) is Britain's most common owl  and lives in close proximity with man. Perhaps as a result of this, tawny owls are often caught in netting (e.g. football nets), which they may not see when flying at dusk. These owls often present having spent considerable time hanging from an entangled wing. Bruising may only become apparent over the ensuing 2-3 days, requiring repeat examinations. Birds of prey are often caught on barbed wire. Severe soft tissue trauma is likely to result (Figure 4 and Figure 5) and the bird may fracture its wing bones in the struggle to free itself. The flight or propatagial membrane is easily traumatised in collisions . Extension of the wing may be severely affected if scar tissue is allowed to form in this membrane and it is therefore essential that any injuries to this membrane are identified and treated appropriately. 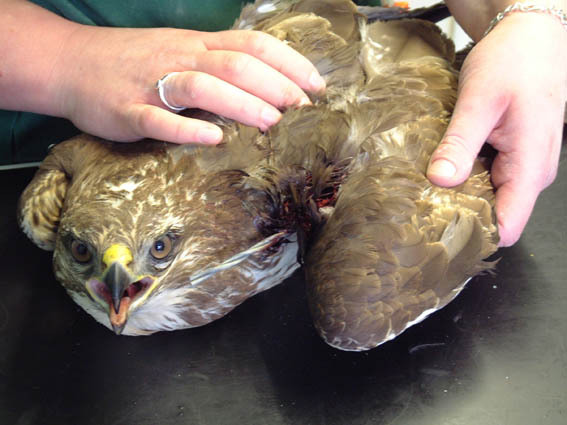 Figure 4 - Figure 4: Buzzard (Buteo buteo) with barbed wire twisted into the tissues of the propatagial membrane. 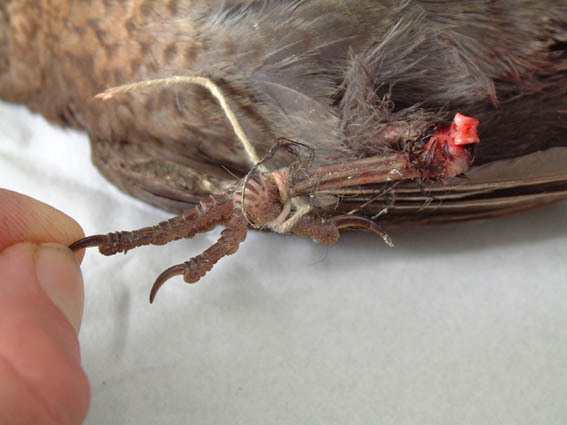 Figure 5 - Figure 5: Close up of the barbed wire injuries to the propatagial membrane of the buzzard (Buteo buteo) in Figure 4. 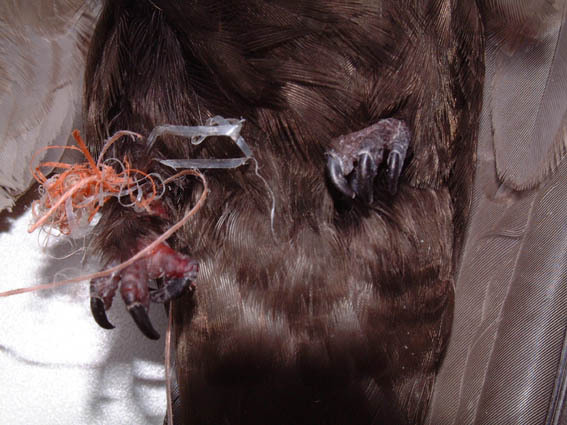 Seabirds and waterfowl are likely to get tangled in fishing lines. Once again these injuries may evade detection unless a scrupulous examination is made. 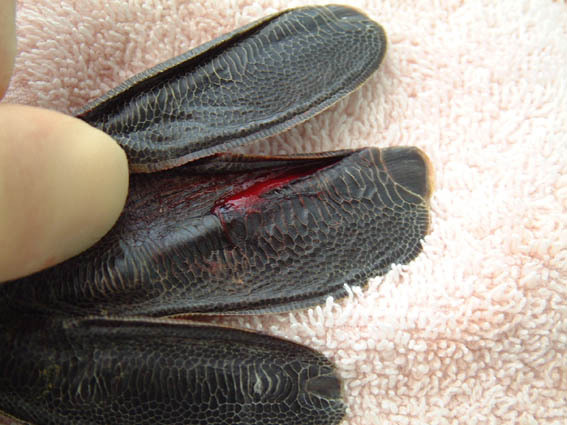 Fishing line and netting can cut into the soft tissues and severely compromise the blood supply to the distal wing. Where a clear line of demarcation between swollen, discoloured tissue and healthy tissue is detected, a fishing line injury should be suspected. The skin, however, may have closed over the line, obscuring it from view. The carpus is often traumatised as it is poorly protected. Swans, in particular, may injure their carpuses when striking out with their wings. Scatty birds such as wood pigeons (Columba palumbus) and certain birds of prey are also likely to suffer trauma to the anterior aspect of this joint if they crash into the walls of their pen or aviary. Careful examination is necessary to ascertain whether there is any joint involvement. Wounds to the body may involve body cavities and essential organs. A good understanding of avian anatomy is therefore important when assessing wounds. Wounds over the upper and lower back may easily enter lung or renal tissue. A puncture wound, produced by a cat's canine tooth, may seal over quickly and look innocuous, but can introduce bacteria deep into the body. Many CBC birds will die of shock and/or septicaemia and careful triage is essential. Wounds to the breast muscle are far less likely to involve body cavities as considerable protection is provided by the large flight muscles and the underlying sternum. Careful palpation may detect small areas of subcutaneous emphysema (trapped air). This will be felt as an area of crepitus but should be differentiated from the crackling sensation that feather palpation can produce, as feathers can trap air too. Subcutaneous emphysema is common in CBC birds (Figure 6) and arises following trauma to the air sacs. This trauma may be blunt or sharp (or both) and results in air leaking into the tissues from the damaged air sac. 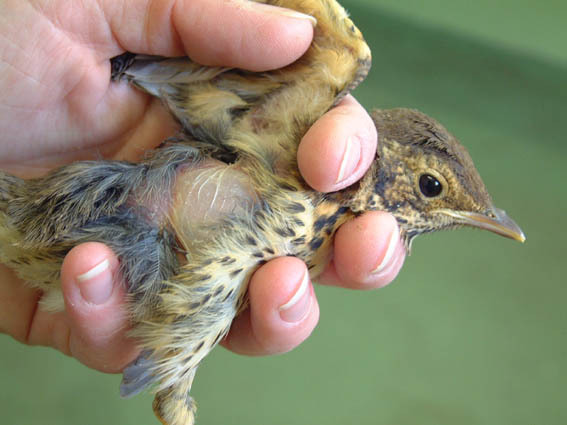 Figure 6 - Figure 6: Subcutaneous emphysema in a caught-by-cat fledgling song thrush (Turdus philomelos). In this case there were no associated wounds suggesting that the emphysema had arisen as a result of blunt trauma. Tiny clots of blood may cause a clump of feathers to matt together, obscuring other small puncture wounds. Such wounds may be caused by the talons of birds of prey, following territorial disputes , or by shooting injuries. Although shotgun pellets do not appear to cause much tissue trauma, airgun pellets tend to drag a large pellet of feather and skin debris into the tissues. Airgun shootings are commonly seen in herring gulls, swans and herons and can be confirmed on X-ray. The keel bone and the overlying tissue is vulnerable to trauma. This is especially so in birds that are unable to stand through weakness, injury and/or disease. In these birds the absence of a protective muscle mass and the time spent resting on the keel is likely to result in the development of localised ischaemia, tissue ulceration and a pressure ulcer. It is therefore of great importance that all thin and grounded birds are examined for keel wounds. This also applies to swans that have hit power lines or crash landed (Figure 7). For the hospitalised bird that is spending prolonged periods resting on its belly, repeat examination is necessary. Palpation of the keel should establish whether the overlying tissues are moving freely over the bone. Failure of the skin to move freely is often the first sign of keel pathology. If only feather damage has been sustained, the bird can be returned to full health quickly. Otherwise, this process is irreversible and progressive . Use of padded floor materials and the possible use of life vests (yet to be designed for swans) may help delay the onset of this condition. 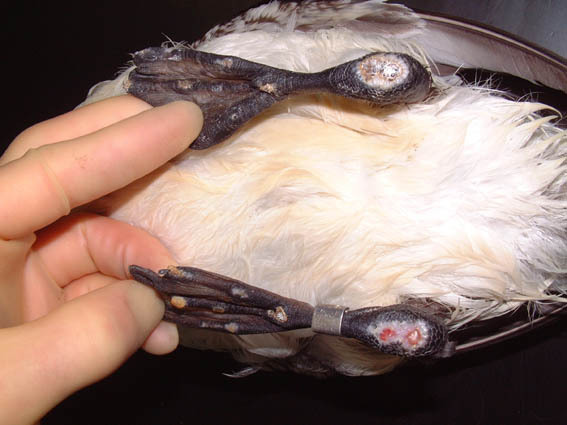 Figure 7 - Figure 7: Severe keel wound in a mute swan (Cygnus olor). The keel bone is exposed and there is considerable inflammation and infection. The pelvic limb is vulnerable to a range of injuries. The foot, in particular, is prone to trauma. 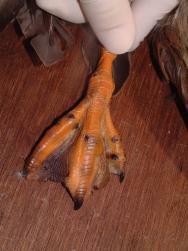 As it is almost always completely featherless , the foot can be easily examined, although injuries can still be missed. Great crested grebes (Podiceps cristatus) have an unfortunate habit of mistaking wet parking lots for waterways. After a hard landing grebes (Podicipedidae) find themselves unable to take off and will often have injuries to their feet. Over a four year period three such grebes were seen, all with injuries to the dorso-ventrally flattened toes Figure 8. Compound fractures/dislocations have also been found in two of the three great crested grebes, necessitating toe amputations. These injuries were only apparent when the toes were manipulated and can be easily overlooked. Figure 8 - Figure 8: Manipulation of the toes of this great crested grebe (Podiceps cristatus) revealed a small wound. The underlying inter-phalangeal joint was unstable as a result of damaged tendons and ligaments. A partial amputation of the digit was performed. The lower leg may become entangled in fine man-made fibres where these have, for example, been collected and used as nesting materials. Swifts (Apus apus), in particular, are prone to such problems and may present with severe devitalisation of the lower limb (Figure 9). Garden birds may become entangled in string as they forage for food, sometimes with disastrous consequences (Figure 10). Figure 9 - Figure 9: Swift (Apus apus) with lower leg and foot entangled in fibre. Note the swelling and discolouration of the affected limb. It is interesting that a bird that lands only to nest should be susceptible to foot/leg problems. Figure 10 - Figure 10: Blackbird (Turdus merula) with foot entangled in garden string. An open dislocation of the intertarsal joint resulted in the ensuing struggle. 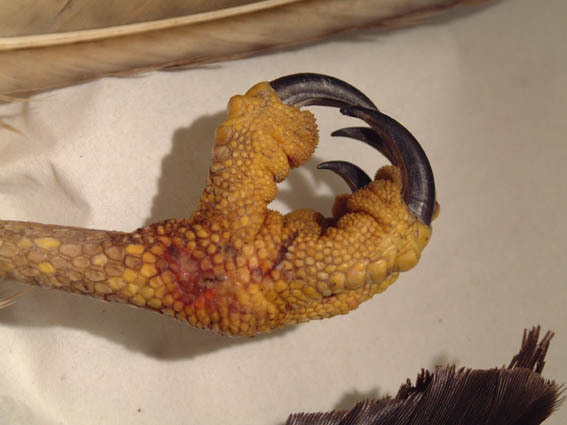 Birds of prey may lock talons in aerial combat, inflicting puncture wounds to any part of the pelvic limb as a result; such injuries are commonly seen in buzzards ,. The buzzard with head wounds seen in Figure 1 also had a number of puncture wounds to the metatarsophalangeal area of both feet (Figure 11). 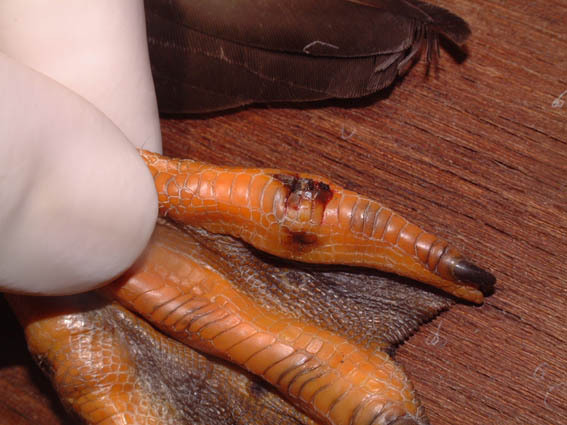 Puncture wounds to the feathered upper legs are harder to detect. Such injuries should always be taken seriously as penetrating injuries will easily result in bacterial contamination of joints and tendon sheaths. Clostridial infections secondary to a talon wound can result in bacterial gas accumulation in the subcutis and underlying musculature. This will be palpable as crepitus and the infected area will become discoloured, then jelly-like and soft. Such injuries should be dealt with aggressively if complications are to be avoided. 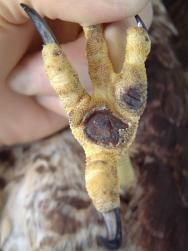 Figure 11 - Figure 11: Puncture wounds to the metatarsophalangeal area of a buzzard's (Buteo buteo) foot. The contralateral limb was similarly affected and the bird had sustained severe head injuries (Figure 1), probably as a result of a territorial dispute with another buzzard. Waterfowl, such as ducks and swans, may present with a range of injuries to their feet. Rat bites can be associated with considerable trauma and infection (Figure 12 and Figure 13). Fishing tackle injuries due to hooks and/or lines are also a common cause of foot trauma. Figure 12 - Figure 12: Multiple rat bites to the right foot of a mallard duck (Anas platyrhynchus). Figure 13 - Figure 13:Close-up of a rat bite over an interphalangeal joint of the left foot of the mallard duck (Anas platyrhynchos) in Figure 12. Bumblefoot, or pododermatitis is a septic condition of the foot leading to abscessation . It usually arises following the introduction of infection into the tissues of the foot. Whilst it is more typically seen in captive birds of prey and poultry as a result of poor husbandry practices, it is also seen in wild birds. A number of factors can predispose to the development of this condition in a range of different wild species. These factors include lameness, penetrating injuries, poor diet and subsequent nutritional deficiencies (e.g. hypovitaminosis A ) and dirty living conditions. Lameness is likely to cause a shifting of weight from the lame to the healthy leg; this in turn may result in ulceration of the healthy foot (Figure 14). Any breakdown in the skin's defences will facilitate the entry of infection into the foot. Classification systems have been proposed for bumblefoot in raptors , dividing cases into three types  or five grades . In waterfowl, especially mute swans (Cygnus olor) the condition may develop following excessive drying and abrasion of the skin . The condition has also been seen in grey herons (Ardea cinerea) (Figure 15). Careful assessment needs to be made of each case and an appropriate treatment plan decided upon. Figure 14 - Figure 14: Type II bumblefoot foot in a buzzard (Buteo buteo). This bird had been shot and had developed severe arthritis of the tibiotarsal joint of the contralateral limb. The bird was emaciated and had a heavy worm burden. Excessive weight bearing on the healthy leg, coupled with malnutrition, is likely to have resulted in the lesions depicted. Figure 15 - Figure 15: Severe bumblefoot (type III) in a grey heron (Ardea cinerea). Severe tendon damage of the first digit was also present and euthanasia was warranted in this case. Auks (Alcidae) such as guillemots (Uria aalge), and other sea birds, together with a number of freshwater birds such as grebes, do not spend much time on land. They have evolved pelvic limbs whose prime function is to propel the bird forward underwater. On land these birds spend considerable time resting on their hocks (inter-tarsal joints). Pressure ulcers develop easily and it is essential that all such birds receive regular examinations. Where changes to the tissues of the plantar aspect of the joint are present, ulceration may soon follow (Figure 16). Bacterial invasion is an inevitable and disastrous consequence requiring euthanasia of the bird on welfare grounds. The aetiology of this condition is likely to be multifactorial: weak, sick, debilitated and malnourished birds tend to spend more time sitting on their hocks. Poor husbandry and the use of inappropriate bedding and floor material are also incriminated. Figure 16 - Figure 16: Severe ulceration of the plantar surfaces of the intertarsal joints (hock sores) and toes in an oiled guillemot (Uria aalge). Sores are commonly seen in debilitated, malnourished birds in captivity. Injuries to the tail are relatively uncommon in most species. However, mute swans and geese that have been attacked by dogs will often have bite wounds to the tail. This is perhaps their "Achilles heel" - the part of the body that the attacking dog will go for. Puncture wounds may be found to this area and should be carefully assessed. These wounds are usually associated with considerable soft tissue trauma. The extent of any hidden damage should be established as soon as possible to arrive at an accurate prognosis. Any injuries or wounds found during the clinical examination must be assessed carefully before an action plan can be developed. This assessment procedure must take into account a number of important considerations including some that are specific to the avian casualty. The avian epidermis has developed only a thin horny layer, since the physical protection in plumage-covered sites is well provided by the keratinized feathers. Once this defensive barrier is breached, however, there is little to protect the exposed underlying tissues, which become prone to dessication. Old wounds may have suffered considerable dessication and the extent of any such complications needs to be assessed. Where fresh wounds are identified, they must be adequately protected to prevent dessication. The assessment of old, chronic wounds and injuries requires an understanding of the avian response to injury and infection. Unlike mammals, birds and reptiles do not have lymph nodes that can filter lymph draining from a focus of inflammation . Instead fibrin exudes into the inflamed area and immobilises both pathogens and inflammatory cells. If the acute cellular and immune responses are able to eliminate the pathogens, the exudate will be reabsorbed slowly by the surrounding granulation tissue. Where pathogens are not eliminated, a state of chronic inflammation can develop in which the exudation of further fibrin is stimulated. The resulting encapsulated abscess is described as a fibriscess . A fibriscess is defined as a localised chronic inflammatory process characterised by the incomplete elimination of pathogens and the continued exudation of fibrin. Where function is impaired by the presence of a fibriscess, as in bumblefoot in waterfowl and birds of prey, surgical intervention is often necessary. Wounds likely to result in significant debilitation/loss of function. This may not be an exhaustive list but, if followed, it will facilitate the selection of the right cases for treatment. Where it is unclear whether a wound is likely to respond to treatment, a day-by-day approach can be taken in which progress is reviewed as more information (radiography results, culture and sensitivity results, repeat leucocyte counts, etc) becomes available. Traumatised birds often have multiple injuries and may be further compromised by dehydration, malnutrition and other problems, especially if there has been a delay (hours or days) between injury and presentation . Fluid and nutritional therapy and treatment for shock are critical in the early management of all traumatised birds. Overzealous wound and fracture treatment before stabilisation of the bird may prove fatal . Some first aid of the wound, however, will inevitably be required. Cleaning - The wound should be cleaned quickly to remove as much contamination as possible. A more thorough cleaning should await veterinary examination of the wound. This is usually performed under general anaesthetic to help minimise stress . Sterile isotonic saline (0.9%) or a solution of 0.05% chlorhexidine may be used. Care should be taken not to wet the bird excessively as this is likely to increase the risks of hypothermia. Haemostasis - veterinary attention should be requested if there is excessive bleeding. Bleeding from most small wounds will stop following the application of a wound dressing. Protection from dehydration - the use of a hydrogel (e.g. Intrasite) will help protect a wound. This can be covered by a vapour permeable film dressing (e.g. Opsite) to provide further protection. Immobilisation - certain wounds may benefit from immobilisation or splinting. A figure of eight dressing can be used to immobilise the lower wing, for example, or the limb can be strapped to the body. Analgesia and antibiotics - broad spectrum antibiotics can be provided in the first instance: clavulanic acid potentiated amoxycillin (150mg/kg orally or subcutaneously) will provide cover against most aerobes and anaerobes. Analgesia can be provided with NSAIDs (e.g. carprofen (Rimadyl)) 5mg/kg subcutaneously or intravenously. Local anaesthetics should not be used in birds due to the suggested sensitivity of birds to drugs of the procaine group . Wound assessment is a critical part of the assessment and examination of the avian wildlife casualty. A rigorous and systematic approach making full use of the available history and the clinician's own experience should ensure the detection of most wounds. Any injuries or wounds found during the clinical examination must be assessed carefully before an action plan can be developed. Only those birds with a good chance of a rapid recovery should be treated although each bird must be assessed on its own merits. In part 2, appropriate wound management plans for specific wound types will be discussed. 1. Degernes LA. Trauma medicine. In: Ritchie BW, Harrison GJ, Harrison LR, editors. Avian Medicine: Principles and Application. Florida: Wingers Publishing, 1994; 417-33. 2. Spearman RIC, Hardy JA. Integument. In: King AS, McLelland J, editors. Form and Function in Birds (Volume 3). London: Academic Press, 1985; 1-52. 3. Cousquer GO. Territorial fight wounds in wild eurasian buzzards (Buteo buteo): presentation and suggested treatment. In: Proceedings of the BVZS 2002 Autumn Conference., Edinburgh, UK. November 2002; . 4. Snow DW, Perrins CM. Birds of the Western Paleartic. Oxford: Oxford University Press, 1998; vol 1; 353-58. 5. Coles BH. Avian Medicine and Surgery. Oxford: Blackwell Science Ltd, 1997. 6. Cooke SW. Waterfowl: swans, geese, ducks, grebes and divers. In: BSAVA Manual of Wildlife Casualties. Gloucester, UK: BSAVA, 2003; 219-31. 7. Simpson VR. Causes of mortality and pathological conditions observed in common buzzards (Buteo buteo) in Cornwall. In: Proceedings of the 1993 European Conference on Avian Medicine and Surgery, March, 1993; NVDV, AAV, Utrecht, The Netherlands. 8. Cooper JE. Birds of Prey: Health and Disease. Oxford: Blackwell Science Ltd, 2002. 9. Oaks JL. Immune and inflammatory responses in falcon Staphyloccal pododermatitis. In: Redig PT, Cooper JE, Remple JD, Hunter DB, editors. Raptor Biomedicine. Minnesota, USA: University of Minnesota Press, 1993. 10. Huchzermeyer FW, Cooper JE. Fibriscess, not abscess, resultng from a localised inflammatory response to infection in birds. Veterinary Record 2000; 147: 515-17.